Most runners liked the light weight and comfortable construction of the Newton Gravity V.
Many were impressed by the updated features of the Newton Gravity including the 4-way stretch mesh metatarsal panels and new reinforced eyelets. The 5th version of the Newton Gravity offers pre-molded heel counter for enhanced fit and improved form. The improved bottom of this shoe, which provides maximum cushioning and improved flexibility, gained positive feedbacks from testers. It has a 360-degree reflectivity feature. The Gravity V is an expensive shoe. Available in limited color choices. The Newton Gravity V is a running shoe for long distance runs, daily training, and uptempo runs. Made lightweight and with enhanced cushioning, flexibility and comfort, this shoe will not disappoint when used on the roads. Despite being expensive, many users still recommend the shoe for road running. The Newton Gravity V is a lightweight neutral trainer. It weighs 230g and has a 3mm heel-to-toe drop. The upper is excellently constructed. It consists of a lightweight, seamless engineered breathable mesh. I found the mesh to be ever so slightly abrasive. However, I tried a barefoot 5km in this shoe, and I did not encounter any hotspots. The upper also features a 4-way stretch mesh metatarsal panels. This is, without doubt, my favorite part of the upper, possibly the best feature of an upper of any shoe that I have tested. The stretch panels allowed my toes to splay nicely without constricting any area of the forefoot. I greatly enjoyed the soft and stretchable feeling of these panels. The upper also comes with a heel lace lock system which allows lockdown of one’s heel, preventing any shifting within the shoe. Another feature is the reinforced eyelets. This ensures that the eyelets are resistant to tearing. This greatly enhances the durability of the shoe. A heel counter is also present, providing additional rearfoot stability and creates a better form and fit for your heel. This technology is present in both the heel and more noticeably in the forefoot. The lugs in the forefoot utilize P.O.P 1 technology, delivering Newton’s most responsive, performance ride. When walking, the lugs felt awkward and clunky, but this feeling vanished when I started running. The ride was extremely unique and enjoyable, especially when I picked up the speed. The Newton Gravity V features a lower heel to toe drop of 3mm to put one in a position to run “most naturally.” This feature encourages a mid-forefoot strike. I landed on my midfoot more often, thanks to the guidance of the prominent lugs and the low-drop of the shoe. An extremely important point to take note is that one should strictly follow the advice that Newton provides to adapt to the shoe. In a previous model of the Newtons, I ignored this advice and ended up being unable to run for 2 weeks. The insole is a standard EVA insole with minimal padding and arch support for additional cushion when landing. The Newton Gravity V has what Newton calls an “s.h.a.r.c outsole.” To put things simply, the outsole is made up of high abrasion rubber in the forefoot and heel to prolong the lifespan of the shoe. After 60km, the shoe is showing little signs of wear in the outsole, even on the unprotected areas. I did not have any issues with traction when running on roads, regardless of weather. However, I did have a slight problem with the grip on a track. The Newton Gravity V excels on the road and track. It is best used for workouts from 5km to Full Marathons. The Upper comes with 360-degree reflectivity. The Newton Gravity V is a durable, lightweight neutral trainer that is fast enough to be used for races. It is built for runners who want a cushioned and responsive ride. The five lugs under the Gravity V are tuned to deliver the highly responsive ride of early Newton shoes, meaning this is a fast-feel shoe, but one with plenty of cushioning in both heel and forefoot. The fifth edition of the Gravity has a revamped upper made from an improved engineer mesh. However, at just over 8 ounces, it’s light and responsive enough to handle speedwork and racing. Flexibility and cushioning was being improved in the Newton Gravity V. It features the new and updated innovative bottom that enhances the shoe’s flexibility feature and full-foot cushioning. The 5th version of the Newton Gravity provides a well-ventilated seamless mesh upper that was improved to provide breathability and added durability. It also lessens the risk of frictions and risk of foot hot spots. It comes with an improved tongue that has a radial band to keep the tongue in place and support foam for added comfort and protection. This new tongue feature does not affect the lightweight construction of the shoe. The pre-molded heel counter of the shoe was enhanced in this version, providing a better fit and form. It comes with a contoured shape that is highly supportive and gives a slip-resistant attribute. The Gravity V features the new way stretch metatarsal mesh panels that can accommodate runners with different foot shapes and widths. The Newton Gravity V promises to give a well-cushioned and smoother ride. It comes with a new anatomically formed insole that offers cushioning consistency and improved ride. The Gravity V has a standard running shoe length. It has a wide toe box and the forefoot area, mid-foot and heel area are well accommodated because of the updated heel counter and enhanced form of the shoe. The outsole unit of the Newton Gravity V uses the high-rebound EVA that offers better cushioning. It provides better shock absorption and protection for the ankle and joints during foot movement. It also gives added shoe durability. Long lasting performance and durability are the things offers by the Gravity V because of the super high abrasion rubber compound (s.h.a.r.c.) in the outsole. It gives added durability against the damaging nature of the roads. The midsole feature the new innovative bottom for a full foot cushioning and enhanced flexibility. It is highly reliable and enhances running experience especially for runners with high arches. It uses the Biomechanical metatarsal sensor plate. This technology provides runners a much better ground contact. It helps runners to stride efficiently and have more stability. The Newton’s Action/Reaction Technology was used in the shoe’s midsole. It provides better impact absorption during landing and offers a much powerful toe-off. It enhances stability and maximizes running performance. 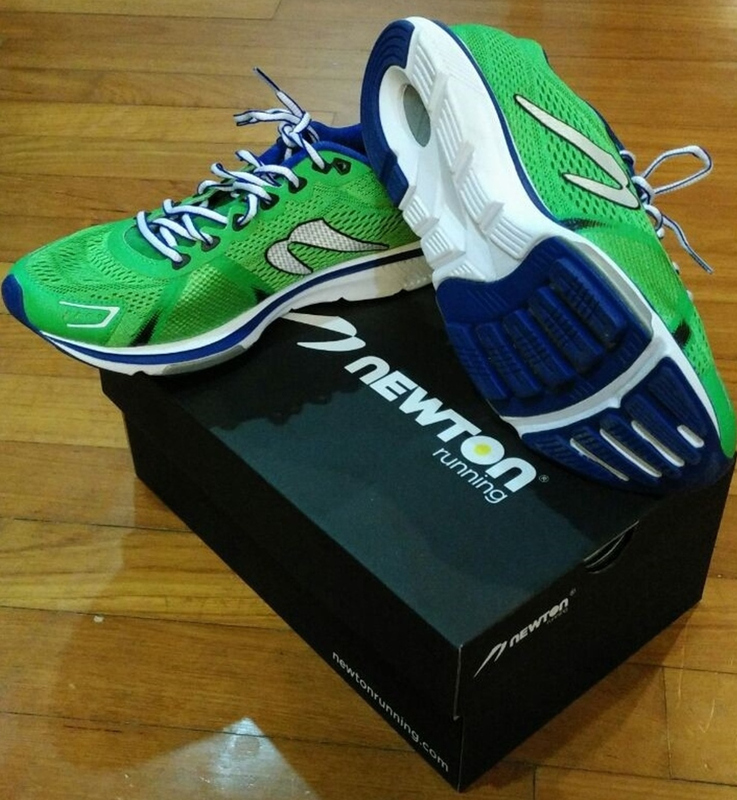 This material is also used in the Newton Gravity 8 and other shoes from Newton Running. The Newton Gravity V features a well-ventilated upper. It comes with a new seamless mesh upper that is highly durable and breathable. It keeps the foot cool and dry while reducing the possibility of frictions and hot spots. The upper offers a tight and secure fitting through the shoe’s heel lace lock system. It creates added friction between the ankle and heel area to keep the foot in place and reduce heel slippage when running. The shoe features the new 4-way stretch mesh metatarsal panels are highly stretchable. It can comfortably accommodate runners with wider feet. The tongue of the Gravity V delivers comfort and protection. It comes with a radial band that keeps the tongue in place and a support foam for a much comfortable running experience.